It's been a few weeks since we completed our kitchen renovations, and I couldn't be happier with the result. My new farmhouse kitchen is country meets Shaker-style, with a little bit of Hamptons thrown into the mix. It has timber benchtops, with a generous kitchen island that I've been dreaming about for years, as I finally have the space to spread out when I make my own pasta and knead bread. It also has a huge double farmhouse sink with a vintage faucet, which I adore, although I have to admit I now find myself terrified each and every time I wash one of my heavy cast iron pots in it. The piece de resistance is my white Belling Richmond range cooker that I'm absolutely in love with. Unfortunately our budget wouldn't permit me to buy the Aga I've been dreaming of for years, and a Rayburn wood-fired oven was totally impractical due to the scorching hot summers we experience where we live, so I turned to this grand British lady instead and I haven't looked back - she has well and truly earned a place in my heart! So much so that when we sell and move on from here, we've decided to install another one in our new home (unless of course we move to Tasmania, in which case a wood-fired Rayburn it is!). Now that we've finished the kitchen, I have seized the opportunity to take stock of the contents of my pantry and spice cupboard to make sure I have all of the essential staples on-hand, as well as rid myself of anything old that was lurking in the back of my pantry. 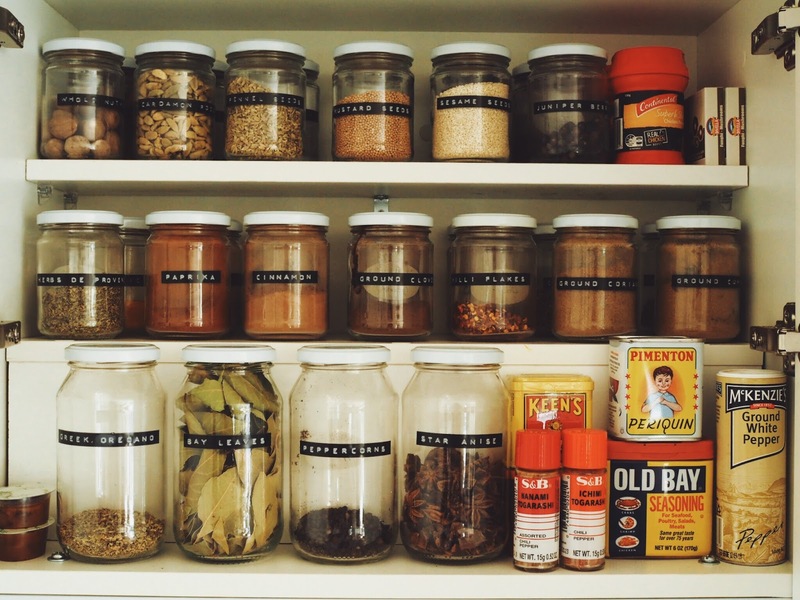 After filling my shelves with jar upon jar of herbs and spices, I was amazed to discover how large my collection was and wondered if I'm the only one who gets a little stressed if they don't have a well-stocked larder. Now before you say I've gone overboard, I use each and every one of these in high rotation, so I couldn't do without any one of them. By no means is this list exhaustive - after filling my jars I discovered I had several more herbs and spices lurking in my pantry, such as tarragon and Chinese 5-spice, but as they didn't fit in the cupboard, there in the pantry they'll remain. Whilst I do enjoy dried herbs, I mostly grow them fresh in the garden. There are certain herbs that I just don't care for dry, such as basil, parsley and chives. Nothing beats the flavour (and scent) of freshly torn basil leaves, do I hear an Amen?! The beauty about growing your own herbs is that you can choose to either use them fresh or dry them yourself and preserve them for later use. Fresh herbs are also a cinch to freeze when they've begun to take over your garden, and this way they don't lose their flavour. I always freeze rosemary, as I have way too much growing in my garden - I literally have a hedge of rosemary growing along the side of our house - so I pop the branches in the freezer whenever I prune them so they don't go to waste. I'd love to know what herbs and spices you always have on-hand and can't do without. Copyright A Cook's Chronicle. Custom design by gatto.